← Weekend Meditation: When do you read manga? When I was still interning at Tokyopop, this title came up in a licensing meeting and the editors and I were all over it. Admittedly, we were easily lured in by the adorable dog pictured on the cover, but also because it seemed like a unique story. There aren’t a lot of manga published in English that make you want to cry, but this is definitely one that will try to hit all your soft spots. Obviously, this one didn’t get licensed by Tokyopop, but the company tried to put the feelers out there by asking fans if they wanted to read manga that made them cry. I can’t remember the result, sadly, and the Tokyopop website is gone for good. I’m very excited for this one, mostly because I feel like cute dog-centric manga aren’t as popular as cute cat-centric manga. I have a huge bias for dogs and I’d much rather read about them than finicky (albeit cute) cats. But also because I did want to see this one (and many other titles that I looked at during those old licensing meetings) in English. I’m glad NBM had the guts to pick this one up and start their manga line with it. I hope this is a sign of many more interesting manga to come! I’m definitely picking Stargazing Dog up come September and I’ll probably cry. The titular canine looks just like my own dog! Broken Frontier has a three-page preview up if you want to take a peek at Stargazing Dog. Unfortunately, there’s no text included. 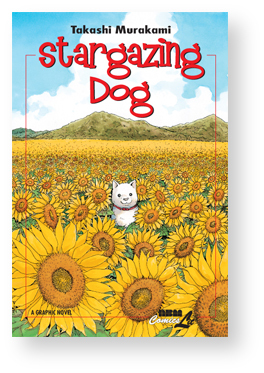 This entry was posted in manga and tagged manga, NBM, Stargazing Dog. Bookmark the permalink. Oh, I happened to pre-order this today.